For the last few years, Comcast has been testing out data caps in a small number of markets, charging customers for exceeding their monthly allotment of 300GB (or offering them the chance to pay even more money for “Unlimited” access). More recently, the nation’s biggest cable company began expanding the number of data cap markets, and a new report shows that these new limitations have not gone over well with Comcast customers. The folks at CutCableToday.com filed a Freedom Of Information Act request with the FCC, looking for information on complaints registered by Comcast customers, and found that more than 13,000 Comcast-related gripes have been filed in just the last few months, many of them specifically about the new data caps. The site has published around 2,000 of those complaints for your reading pleasure. One customer from Atlanta — one of the newer markets to get the cap — says that while Comcast does provide an online metering tool for users to keep track of what’s left in their data bucket, the tracker had been down for 26 days during the previous billing cycle. Then there’s the person from Nashville who has seen their Comcast bill soar because of overage charges. A customer in Miami — another recent addition to Comcast’s cap test — complains about paying for top-tier 100Mbps download speeds but rarely getting more than 10Mbps; the data caps are like rubbing salt in that wound. In fact, the term “monopoly” pops up more than 250 times in the 2,000 complaints published by CutCableToday. To us, that illustrates how powerless many consumers feel with regard to their Internet service provider. 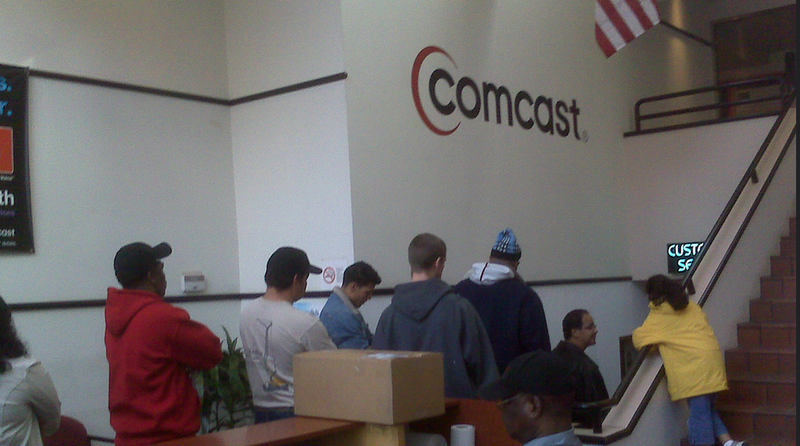 If these people could jump ship to another provider, they probably would. But they can’t, so they stick with Comcast and complain to the FCC in the hopes that something, anything might change. During its failed attempt to merge with Time Warner Cable, Comcast and its supporters argued that there was robust competition in the marketplace, even in the many markets with only one true consumer broadband provider. They pointed to the existence of satellite TV and wireless data, but satellite Internet is slow and expensive, and while wireless data can now provide download speeds rivaling that of cable broadband, its incredibly restrictive data caps mean most consumers would quickly run into costly overage territory. Wireless providers have argued that they need data caps to manage network congestion, but Comcast’s own internal documents explicitly state that the purpose of data caps is not congestion management. Comcast CEO Brian Roberts has been on the cap-justification campaign trail recently, comparing Internet usage with electrical use. Put aside for the moment the fact that Roberts and just about the entire telecom industry has spent the last year-plus arguing that broadband should not be treated like a utility, and think about how facile his analogy is. Yes, when someone turns up their air-conditioner, their electric bill often goes up. But if that same person goes away for a couple weeks, leaving the lights, TV, and a/c off while they’re away, their bill goes down. Unless you’re on some sort of restricted payment plan with your electrical provider, your monthly bill is based on what you use, not on a maximum that you can use with penalties for going over.